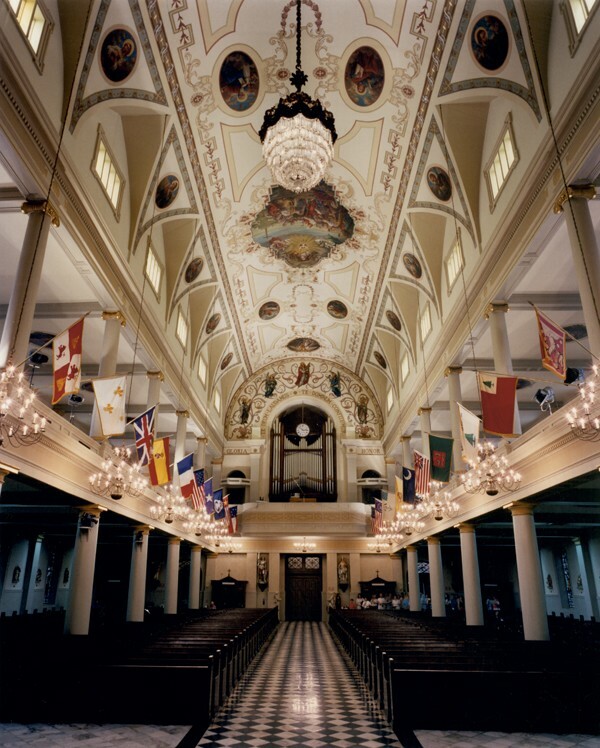 For the Cathedral – Basilica of Saint Louis, King of France in New Orleans, Louisiana, Conrad Schmitt Studios was brought in to repair a damaged 19th century Erasmus Humbrecht paintings. After a 4 ft. X 6 ft. section of aged inch thick plaster had broken free, tearing a ragged patch from the 1872 mural, further investigation uncovered that other portions of the murals were sagging. The conservation included repairing the damaged plaster and fixing uneven repairs to the murals from previous plaster damage. The work moved beyond the murals to a total restoration of the interior of the Cathedral. See a short clip of additional interior views of the Cathedral.